Located on one of the eight major Iron Islands stands the castle of Pyke. It is the seat of House Greyjoy and capital of the Ironborn - a hardy, seafaring people who are characterized by their courage and determination, despite their harsh surroundings. They know what they want and they take it. They pay the Iron Price. The Iron Islands themselves are small and rocky, swept by fierce storm winds, with poor soil and hardly any natural resources. The few poor crop fields that are present are plowed and toiled by the Greyjoy's thralls. So, it only seems fitting that Talisker Distillery, situated on the small and craggy island of Skye, would identify with this hardy house. The Isle of Skye's wave-beaten shores imbue Talisker’s liquid with a distinct rugged character, evocative of the Ironborn and their home. 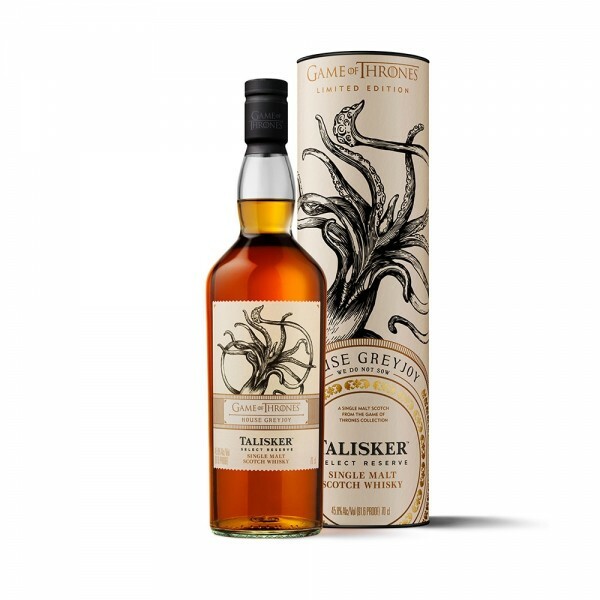 This is an intense, smoky single malt, with spicy, sweet notes and a hue as golden as the Greyjoy banner. There's simply no better dram to raise to the Drowned God.